My introduction to local Ecuadorian politics began with Isabel, my housekeeper and her husband, Gonzalo. Lots of times, going into Latacunga, I had seen him wave at a person or pull the car over to briefly shake a hand. And of course, now I know why. 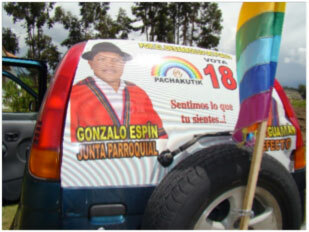 I had seen his car with a special banner on the back announcing that he is running for the local Poalo council while another person was running for Latacunga regional government. And we have the pennants attached to vehicles and then they gave me a scarf to wear. So I thought I had better find out what is happening before I wear my scarf and find myself in trouble. I live in a very indigenous area, primarily Andean Kitchwa. 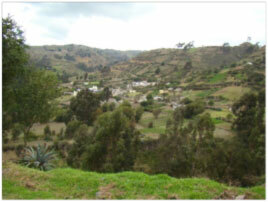 Gonzalo has been studying in Quito at the university topics like community management and most recently has been supervising the construction of a co-operative milk processing facility in the village. And he was the one who brought the Mayor to see my dog bite last year. 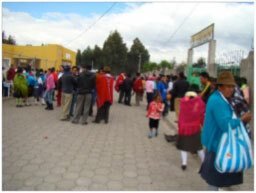 So on February 23 there was an election for all the positions in the country at municipal and provincial levels. 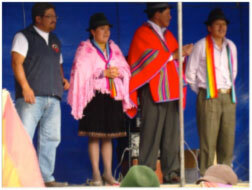 Gonzalo ran under the banner of the indigenous party, Pachatutik. 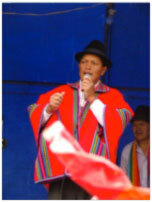 Founded in 1998, the party has a somewhat Leftist leaning and has operated at the national level mainly to get the indigenous perspective directly represented. Like many fledgling parties there have been internal issues, but for the main, the focus is on getting a better deal for the nearly 30% of the country who are indigenous. Since this area and Latacunga are quite indigenous, I think I shall be quite safe to wear my scarf here. Meanwhile, most evenings, Isabel has been out being the dutiful political wife cooking meals for those who attend meetings. And, of course, they have being out putting up posters and flags - these seem to get used more than signs here. Well, the way elections work around here you can chase votes until 2 days before the election and on Sunday, February 23, was the election. So Isabel and Gonzalo invited me on February 19 for the last major politicking event, a caravan. They picked me up about 12:30 lunch and we drove as a cavalcade of vehicles thorough all the local communities that represent this canton, in other words, Gonzalo's area. The lead vehicle for much of the way was a 3-wheeler with a wagon on the back with a very loud speaker including a siren. Gonzalo was on this. From a distance he was easy to see in his brilliant red poncho. The second vehicle was the Senor de Maca band, playing live generally when we went through anywhere with a group of folks. Then came our car, since I was with the politician’s wife, followed by a good 2 dozen or more of assorted vehicles with lots of flags. We had flags on top and I had a flag to wave out the window. Poalo, my little community, was the start point and by far the most developed. We went through quite a circular route taking in anywhere that might have people. Often I thought I was counting more dogs! The route wound its way up the steep hills around here and I had some amazing vistas. The terrain was very dry up high and reminded me of the driest of the Okanagan or even parts of Alberta near Drumheller. The roads were mainly dirt or hand laid stones with many switchbacks. There were little tiny communities with small schools but I did not see much in the way if other services like health centres. A very few had small town squares. Mostly very rural people on quite steep marginal land with modest houses. Isabel pointed out Gonzalo's home, her family area and the house they first lived in for 2 years. 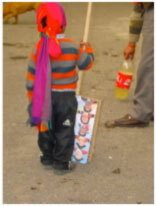 In a number of areas, it really seems quite poor, but I don’t know if they regard themselves that way. This went on all afternoon, until close to 6 when we finally arrived back at the edge of Poalo. 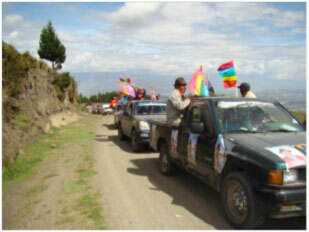 Then most got off the vehicles and processed by foot carrying flags and placards into Poalo and around the square before stopping at the place set up for speeches, music, food, drink and dancing. First came speeches with each candidate presenting issues and concerns usually both in Spanish and Kitchwan, often to rousing support. And as you can see there were some very young campaigners! Then, the fun part. I had a little chicha which is a locally made brew, this time rather sweet and actually drinkable. The version I had in Amazonia is made with yucca and this was much better. 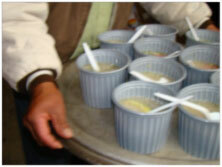 Then a kind of cross between soup and lamb stew, with many servings passed out. In addition they were handing out beer which would have been fine and then a kind of "aqua caliente", a sort of very potent whiskey which I declined although offered in very small thimbles. There was dancing and I managed to make my way though one very long dance number with another woman as no one else was dancing. So they are certainly getting to know I am. But the knees will only handle so much. The party was going to go on for quite a while but I felt that by 7 p.m. I was ready for home, so fortunately one of Isabel’s brothers could give me a lift. As far as I know the event went on quite late.